A radiograph (sometimes called an x-ray) is a type of photograph that can look inside the body and reveal information that may not be obvious from the outside. 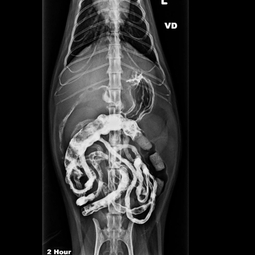 These pictures assist our veterinary team with diagnosing abnormalities in the skeletal, cardiovascular, pulmonary, gastrointestinal, reproductive, and urinary systems. In addition, our animal hospital has access to board certified radiologists to evaluate any x-rays that are taken on your pet, to assist if necessary, in providing a better diagnosis.